The child in the child is somehow faded. She is eight years old but there is nothing in her manner to say she isn’t nineteen, with a house full of screaming babies and a high school sweetheart who doesn’t always come home at night anymore. She walks the front yard like walking is already a chore, collecting the mongrel puppies. There are nine of them and her fingers disappear into the long coats as she picks them up, then puts them in a cardboard box next to the front door. The house is a shack, about a block from the abandoned half-mile dirt track where LeeRoy Yarbrough, the most famous man ever to come out of west Jacksonville, Florida, got his start racing automobiles. About three blocks from the place where, a month before, cold sober, he tried to strangle his own mother. The door slams shut, but the woman stays there, behind it in the shadows. In west Jacksonville it always feels like there’s somebody watching behind the screen door. 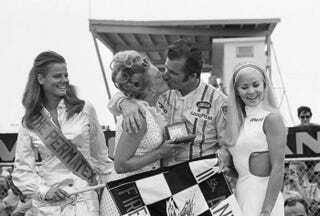 I’m going to tell you right here that I don’t know what picked LeeRoy Yarbrough off the top of his world in 1969 and delivered him, eleven years later, to the night when he would get up off a living room chair and tell his mother, “I hate to do this to you,” and then try to kill her. I can tell you some of how it happened, I can tell you what the doctors said, what his people said. But I don’t know why. It has business with that little girl and her puppies, though. With not looking at what you don’t want to see, putting it off until you are face-to-face with something unspeakable. And tonight those nine puppies go to the bottom of the lake.